And I said to him, “Well whether he’s alive or not, he’s not here, Brother. So the work is on us to do.” And I gently passed it off. One day, almost two years later, he was in my Lincoln Continental in Chicago, and he saw what he had given me, kind of ground up a little under the front driver’s seat. So he took it out and smoothed it out, like one would do a wrinkled coat or shirt and knew that it wasn’t destroyed. And he put it back in my hands. I finally decided I will entertain him. I’ll read it. And as I began to read what he wrote, the words of the Honorable Elijah Muhammad began to make sense. They couldn’t make sense if he were dead. But, if he escaped a death plot, then the words that he shared with me made almost perfect sense. I say, almost, because he told me he would be gone for three years, approximately. And he was going away to study. Now it was approximately three years. It was actually 30 months. I was up; ready to take on the Herculean task of attempting to rebuild his work. Now what you saw in your experience crystallizes all of this for me, because he now was in me; growing in me. But there were certain experiences that I had to undergo for him to fully grow in me and for me to fully grow in him. So Elijah did come back. 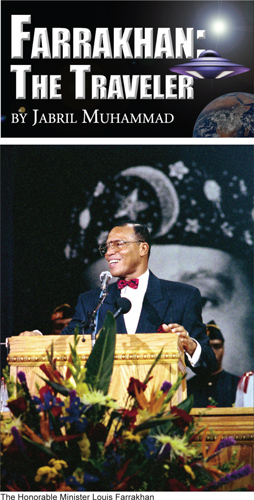 He came back in the person of Louis Farrakhan. He came back in me because my love for him; my adoration of him; my surrender of myself to him. Going back to my first hearing that God had raised a man for us. And knowing that I had searched for a man like this all my life, then I surrendered myself to him completely, so he was able to put himself in me. And when he left us in 1975, he knew that what he desired to do had been done, it only needed time; watering; circumstances; events for him to grow again in me. Coming back to your experience, when you heard his voice saying, “They are coming for me in him.” That suggests to me that oneness with him has been accomplished and he now has my mind. And my mind is now lined up with his in more ways than I probably at this juncture fully understand, but will grow to manifest it more and more. If they’re coming for him in me then my presence ends their presence and destroys their future. So they have come to the decision; to the determination that I and we must be destroyed for them to have a future. The feet that you heard represents many troops; the many minds; the many forces that are lock-stepped now in agreement to get him in me and to get us out of the way. We knew that such a time as this would come. And we knew that this is the only way that God can prove His presence; His choice of a people; His power. In those footsteps of the many conspirators; hypocrites; devils, under the direction of Satan himself, they will be defeated totally and completely and then the Kingdom of God will be established. Well, Paul was killed eventually, by the enemies of Jesus. But the actual meaning of that is the fulfillment of his promise: “If you are faithful, when I return, I will reveal the new teaching through you.” But also it tells me that he was telling me, not about himself, but about my future. He was telling me that at a certain point I will be taken. At a certain point I will be going away and I will be gone for approximately three years. And I will be going away to study. And for him, if I had been found faithful or worthy to begin (I think he’s already given me the full word of such a book) but now the book, if it’s not already planted in my heart, he will give it to me in our second meeting. During that absence for three years, the power of the enemy will be broken in war. The seals of the book cannot be opened while the enemy still has power, as he taught us. That expression that you shared with me, which was so very short, but yet so powerful; so profound that it confirms what I thought. It confirms what I believed and translates belief now into the sure truth, or the certainty of knowledge. Why I’m using the above photo? Next article I’ll explain what’s in my mind, Allah Willing.